Central Petroleum Limited is an oil and gas explorer and producer listed on the ASX focused on supplying the domestic gas market. Central is advancing several separate projects across what is regarded as the biggest package of proven and prospective oil and gas acreage across central Australia. Central operates the Mereenie oil and gas field, Palm Valley gas field and Dingo gas field. Both Palm Valley and Mereenie commenced production in the 1980s. The Northern Gas Pipeline under construction, by opening up new gas markets, heralds the dawn of an exciting new era. When it assumed operatorship less than a year ago, 93% of its workforce were FIFO – now less than 50%. Half of the local workforce is of indigenous extraction. - Family Values for Working Families – Under this strategy Central maximises the number of employees who can commute daily from their homes in Alice Springs. - Traditional Values for Traditional Owners – Under this strategy Central is committed to training and employing people on whose land we operate and indigenous employees generally. Already nearly 30% of our operational employees are indigenous. 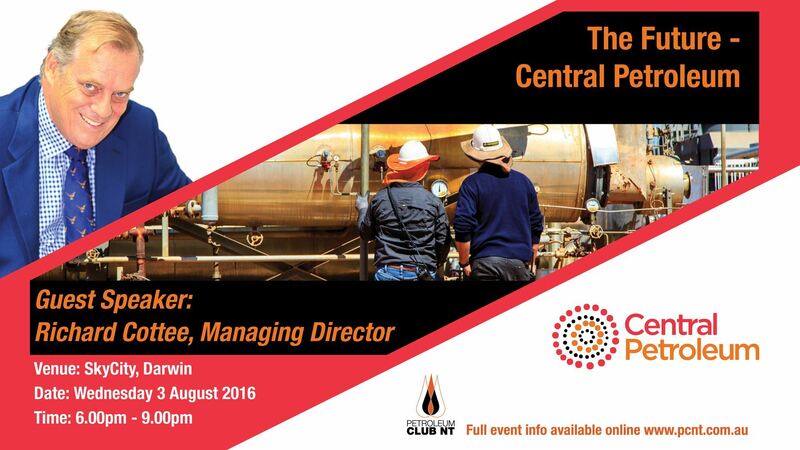 Richard Cottee, currently Managing Director of Central Petroleum, is an illustrious Australian gas industry veteran. He has worked in a wide range of roles within the industry, most notably being his tenure as Managing Director of QGC, which saw him take the company from an early stage explorer to a major unconventional gas supplier, and eventually selling the company to BG Group for $5.7 billion in 2008. Richard is a truly engaging speaker with a great deal of experience to draw upon - don't miss this opportunity to hear his presentation and network with industry colleagues.